Resources from the International Social Work #MacroSW Twitter Chat on May 22, 2014 are listed below. A summary with an edited stream of tweets is at Storify . Resources mentioned in the chat are below at the end of the References/Resources section taken from the blog post. Greenslade, L. and and Vos, A. (2008, Summer). Creating YOUR Social Work Career. The New Social Worker 15:3, 10-13. This list comes from presentation topics at the Joint World Conference on Social Work, Education and Social Development in Melbourne (July 2014). It is organized by by the International Association of Schools of Social Work (IASSW), the International Council on Social Welfare (ICSW), and the International Federation of Social Workers (IFSW). There are many excellent U.N. resources with important human rights, social welfare and social development reports, and the U.N. conventions on human rights. So You Want to Work Abroad? 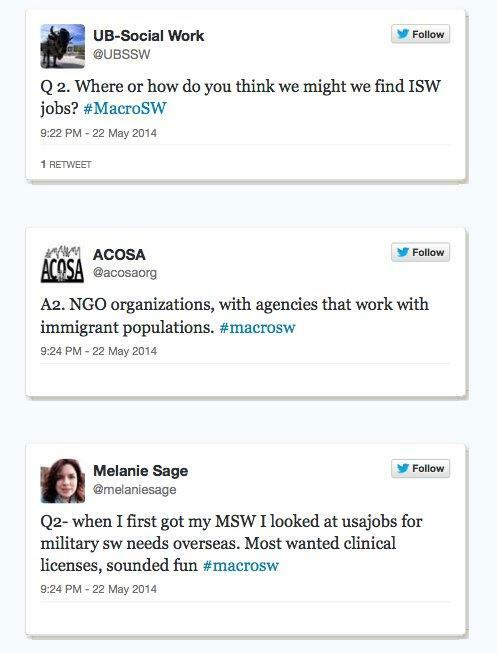 (The #MacroSW Twitter Chat on International Social Work was held May 22nd, 2014 .